The County maintains the corridor lands alongside the trail and has granted easements and licenses to several companies and public agencies for underground pipelines, cables, utility lines such as water and sewer lines, fiberoptics, and flood control facilities. Parts of some local streets are within the corridor as well, such as part of Jones Road and South Broadway in Walnut Creek. 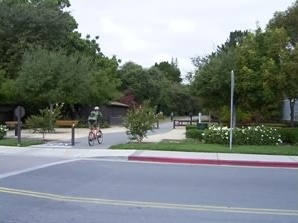 As the trail became increasingly popular, residents living along the corridor requested that Contra Costa County allow for landscaping in the corridor. In response, the county developed the Iron Horse Corridor Management Program which includes a Landscape Element. The Management Program, among other things, allows for landscaping by individuals or groups under specific conditions.